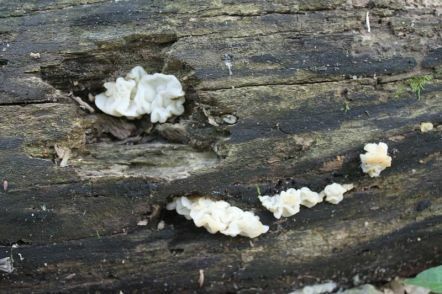 A somewhat common jelly fungus that fruits on hardwoods. I often see it fruiting from the ends of logs that have been cut with a chainsaw. It also likes well decomposed logs that have lost their bark. As the jelly ages, it begins to turn yellow, and then eventually brownish. It tends to be most commonly found with a slightly yellowish hue. 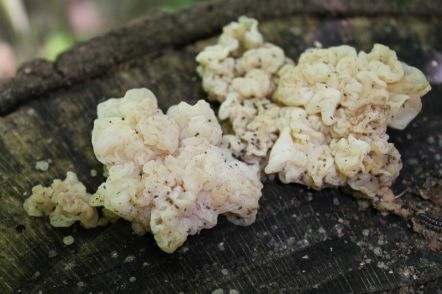 Tremella fuciformis is fairly similar but is less "brain-like." The edges of T. fuciformis are often more clearly defined and crisp. Auricularia auricula - Wood Ear - do not have as many lobes, and have a more solid gelatinous texture, rather than a jelly-like texture. Tremella mesenterica - Witch's Butter - has a yellow color and edges that are more well defined.